Surprise, surprise, surprise happened to router-switch.com. What’s it? Yeah, here it is proud to announce the release of its newly redesigned website. 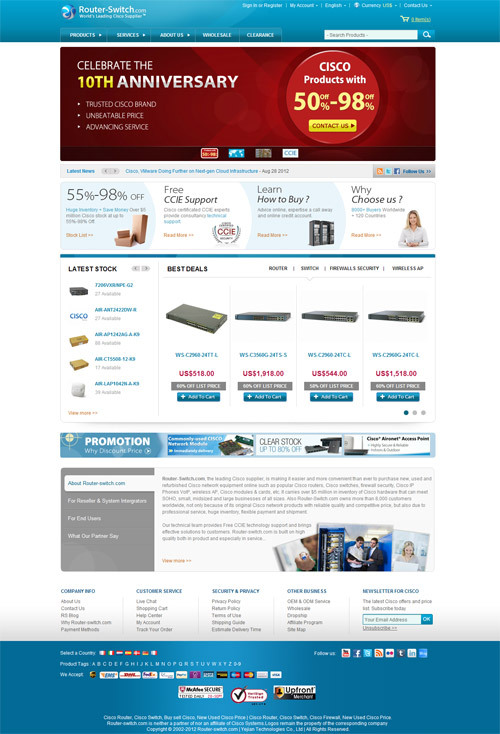 By updating its main site, https://www.router-switch.com/ which is brighter, more user-friendly offers a comprehensive understanding of router-switch.com and provides Cisco buyers and users with popular Cisco equipment and full resources related Cisco hardware and networking. When entering the new site, look for the “PRODUCTS” “SERVICES” “ABOUT US” “WHOLESALE” “CLEARANCE” main tabs at the top to find all information of Cisco and Cisco Network you wanna get. For example, if you wanna to look for Cisco products, you can click the “PRODUCTS” to select suitable Cisco equipment, maybe a Cisco router, Cisco switch, or Cisco firewall. The “SERVIVES”, mainly provide the information of CCIE support, Cisco docs, technical cases, configuration services, etc. “ABOUT US” resource will offer you detailed information that can help you understand router-switch.com well, such as RS blog (all kinds of Cisco news and Cisco hardware tips and tutorials), social media platform (let’s communicate with Cisco users and Cisco clients well), overview of router-switch.com, its advantages and so on. Maybe Cisco buyers pay more attention to the stocks and best deals of Cisco products, so here viewers can learn about the latest stock and BEST DEALS (the main items are Cisco routers, Cisco switches, Cisco firewalls and Cisco wireless AP). The new version of router-switch.com aims to provide Cisco buyer and users more professional service online. The highlights are the service part, which offer more channels to know Cisco hardware well. By Services, you can see Free CCIE Support, GPL Updating, Network Health Check, Asset Recovery, Cisco Documents, Structured Cabling, Technical Cases, and Configuration Services, which are useful resources for Cisco clients. Router-switch.com (also called Yejian Technologies Co., Ltd), the world’s leading Cisco supplier, is making it easier and more convenient than ever to purchase new, used and refurbished CISCO network equipment online such as popular Cisco routers, Cisco switches, firewall security, Cisco IP Phones, wireless AP, Cisco modules & cards, etc. It carries over $5 million in inventory of Cisco hardware and Cisco equipment that can meet SOHO, small, midsized and large businesses of all sizes. Also Router-Switch.com owns more than 8,000 customers worldwide, not only because of its original Cisco products with reliable quality and competitive price, but also due to professional service, huge inventory, flexible payment and shipment. In 2012, router-switch.com welcomes its 10th anniversary. To celebrate 10 years, it prepares big gifts for its regulars and new clients, such as Cisco AIR-AP1131AG-A-K9, limited edition T-shirts and 20PC U disk. Some popular Cisco products (including Cisco routers, Cisco switches, Cisco firewall and Cisco Access Points) will have big discounts (up to 75% off). The activity date is from September to October. Wow, if you are a Cisco buyer, don’t miss this chance. Let’s join the party to celebrate the 10th birthday together. It believes that router-switch.com will become more professional, more reliable and stronger with your support.